Many times THE DOCTOR crouches about to pounce on intrinsic deficiencies beclouding medical bureaucracy, then shies away at almost every opportunity. 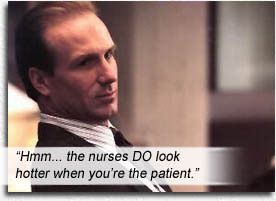 Imperious and detached doctor MacKee (the remarkable William Hurt) is diagnosed with cancer and is somehow thrown in amongst the rabble (i.e. average hospital patients) instead of being given preferential treatment for being a surgeon. Amongst the afflicted low-class masses MacKee undergoes the same tribulations all the rest of us go through every single time we are humiliated into being a patient at the hands of god-minded doctors – things like not being able to find his files, being patronized, being made to fill out forms, being made to wait (you know, be “patient”). He realizes how out-of-touch he is with his own hospital and its dehumanizing protocols. However, his ultimately smooth operation and recovery tempers the humiliating difficulties he was made to suffer, so I’m not buying the movie’s resolution, where he retains the horrors of patient-dom fresh in his mind and makes efforts to palliate them. And he’s a doctor. Read as financially stable. His wallet is completely unaffected, thereby negating whole chains of effects that compound problems between patients, their afflictions and hospitals. Second act enters Chick Flick mode when MacKee’s marriage falters (with Christine Lahti – who does a great “sad smile” – playing the troubled wife more as a device than a real person) and he leans on fellow patient (pert, young and pale Elizabeth Perkins) for psychological support. Platonically. Doubt this faux-romance would have flared up had Perkins been 58 and slightly paunchy. The disdain that the black hole vortex of the medical profession piles on us non-medical civilians cannot be assuaged by this shallow fantasy, which ends with MacKee reconciling his marriage (after his platonic pillar dies) and then forcing his med students to pretend patienthood for 72 hours to experience patient humiliation. Though addressing the problem from the wrong end, it is a nice sentiment. But I doubt any of those wealthy surgeons who consider themselves god will ever feel our merely human unaffordable pain. Writers: Ed Rosenbaum, Robert Caswell. Starring: William Hurt, Christine Lahti, Elizabeth Perkins, Mandy Patinkin, Adam Arkin, Charlie Korsmo, Wendy Crewson.